Background Mind-body therapies (MBTs) are used throughout the world in treatment, disease prevention, and health promotion. However, the mechanisms by which MBTs exert their positive effects are not well understood. Investigations into MBTs using functional genomics have revolutionized the understanding of MBT mechanisms and their effects on human physiology. Methods We searched the literature for the effects of MBTs on functional genomics determinants using MEDLINE, supplemented by a manual search of additional journals and a reference list review. Results We reviewed 15 trials that measured global or targeted transcriptomic, epigenomic, or proteomic changes in peripheral blood. Sample sizes ranged from small pilot studies (n=2) to large trials (n=500). While the reliability of individual genes from trial to trial was often inconsistent, genes related to inflammatory response, particularly those involved in the nuclear factor-kappa B (NF-κB) pathway, were consistently downregulated across most studies. Conclusion In general, existing trials focusing on gene expression changes brought about by MBTs have revealed intriguing connections to the immune system through the NF-κB cascade, to telomere maintenance, and to apoptotic regulation. However, these findings are limited to a small number of trials and relatively small sample sizes. More rigorous randomized controlled trials of healthy subjects and specific disease states are warranted. Future research should investigate functional genomics areas both upstream and downstream of MBT-related gene expression changes—from epigenomics to proteomics and metabolomics. Because of their wide range of effects, MBTs have been studied in a variety of disease states. Evidence has shown the efficacy of MBTs in treating conditions such as cardiovascular disease, inflammatory disease6, hypertension,6,14 irritable bowel syndrome,15 insomnia,6,16 chronic pain,17,18 depression,19,20,21 and posttraumatic stress disorder (PTSD).22 In aggregate, the effectiveness of MBT interventions is modest,21,23 and the specific mechanisms of action of MBT are not well understood. To uncover genomic determinants and molecular pathways involved in the changes brought about by MBT, researchers are turning to functional genomics, a developing field that encompasses genomics, epigenomics, transcriptomics, proteomics, and metabolomics. Since the completion of the first draft of the human genome in 2003, there has been exponential growth in understanding the genomic determinants of disease and identifying biomarkers for disease management. Through the measurement of thousands of genomic determinants, functional genomics technologies are able to generate hypotheses about disease processes and intervention effects at molecular levels. More recently, functional genomics has been applied to further our understanding of MBT. A 2013 review described 3 early trials,24 but no review has tackled the full breadth of functional genomics approaches to MBT research. A broad array of processes modulates gene expression; a subset of these processes is the group of molecular mechanisms known collectively as epigenetics. Epigenetics includes stable, long-term changes in gene expression through DNA methylation, histone modification, and chromatin remodeling, some of which offspring can inherit.27,28 By definition, epigenetic mechanisms do not involve alteration of the DNA sequence (ie, do not involve DNA mutation). The sum of active epigenetic mechanisms in a given cell comprises the epigenome; these mechanisms effectively activate and deactivate sections of the genome, enabling or preventing their transcription into RNA and subsequent translation into proteins. Histone protein modifications change the way the DNA strand is wrapped around the nucleosome, thus altering which regions are accessible for transcription. While many histone modifications have been reported in the literature (eg, lysine acetylation, lysine methylation, and serine phosphorylation), the functional meaning of these changes is not well understood.29 DNA methylation involves the addition of a methyl group to the cytosine in a cytosine-guanine sequence (CpG). High-precision technologies are now able to analyze the methylation status per base level. While the majority of these pairings are scattered throughout the genome, approximately 10% of human CpGs cluster in distinct groupings known as CpG islands. Methylation of these CpG islands is believed to be responsible for long-term heritable changes as well as the process of cell lineage differentiation.30 However, epigenomic comparison across tissue types is challenging because methylation patterns vary among different cell types. Metabolomics is the study of the terminal downstream products of the genome, mainly small molecules and other low-molecular-weight end products of cellular processes. While the scope of metabolomic methods such as mass spectrometry and high-resolution nuclear magnetic resonance spectrometry is limited to a subset of the available small molecules in the cellular milieu, these analyses can be paired with quantitative measurements of small-molecule metabolites to provide a fuller picture of cellular activity. In general, functional genomics approaches can be used in 2 ways. Omics approaches, because of their ability to look at the entire epigenome, transcriptome, proteome, or metabolome, are well suited for asking questions that are hypothesis generating, making them useful for exploring new areas. To make sense of the large quantities of data generated by omics methods, bioinformatics and systems biology approaches are frequently used to identify genes clustered into specific pathways, often centered around focus genes or hubs.34 Using gene ontology groupings, it is also possible to ask targeted questions with omics data by analyzing data based on clusters of functionally related genes. Targeted studies, on the other hand, focus on the expression of specific genes or downstream markers. Because of the relative statistical power granted by the limited number of target genes or biomarkers, these targeted methods can provide more reliable quantitative data on specific differential expression than omics approaches. Targeted methods have a limited ability to detect patterns not contained within a priori hypotheses and can risk confirming false hypotheses by missing unmeasured mediators of effects. To assess the research applying functional genomics to MBTs, we searched MEDLINE for terms describing MBT (yoga, meditation, tai chi, stress management, stress reduction, and mind-body) and functional genomics (epigenetic, transcriptomic, gene expression, proteomic, and metabolomic). This search yielded 105 papers published between April 1999 and May 2014. Of these, 14 studies reported results of functional genomics analysis of humans practicing MBTs. One trial35 did not appear in the initial search results but was included because of repeated mention in multiple reviews appearing in the results, bringing the total number of studies to 15. The studies included for analysis are described in the Table. In the application of functional genomics to MBTs, the studies employed diverse designs and methods. Of the 15 trials, 4 were exclusively cross-sectional, comparing practitioners experienced in a given MBT to matched control subjects. Five trials used standard interventional designs with individuals or groups, assessing genomics outcomes before and after training in a specific MBT. Three studies solely employed a rapid-response method to assess changes in response to MBT by comparing samples from experienced practitioners before and after practice. Last, 3 studies used multiple methods: 1 was cross-sectional and interventional, 1 was cross-sectional and rapid-response, and 1 used all 3 methods. In the 2 studies using both cross-sectional and interventional methods, researchers compared naive practitioners to themselves and experienced practitioners. 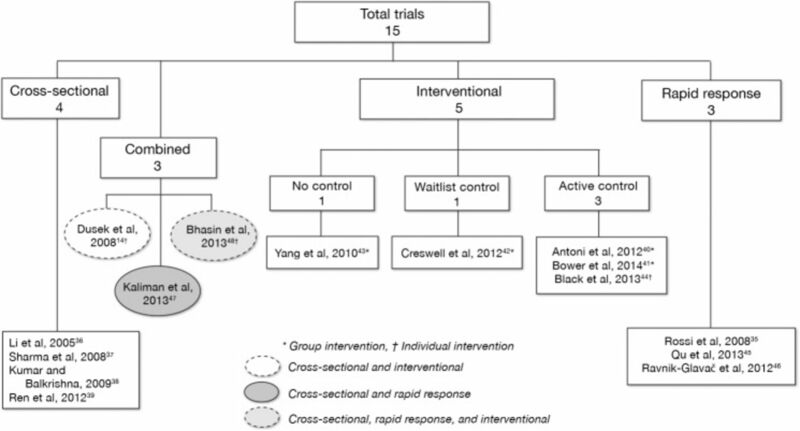 Of the 5 interventional-only studies, 3 used active control interventions, 1 used a waitlist control, and 1 had no controls, employing a quasiexperimental pre/post design. Figure 2 shows a detailed flow of study design types. Trials included in this review by study design type, use of controls, and time course of effects measured. Study populations consisted primarily of healthy subjects. In 3 separate studies, however, populations were leukemia patients, women with current breast cancer diagnoses, and women with breast cancer histories reporting fatigue. In trials comparing experienced mind-body practitioners to controls, reported experience levels varied from 1-25 years. Many trials did not report the higher end of experience levels; 1 study reported estimated total lifetime practice hours as a measure of practitioner experience. Among interventional studies (alone and combined), 4 delivered 8-week interventions, 1 delivered a 10-week intervention, and 2 delivered 12-week interventions. Frequency and duration of practice for the interventions varied as well. Required at-home practice varied from 12-30 minutes daily; programs involving tai chi or yoga postures reported longer practice sessions, such as 90-minute sessions twice weekly. Experienced practitioners in cross-sectional studies reported higher levels of practice, with some studies reporting 60 minutes or more of average daily practice. The studies applied functional genomics to commonly practiced MBTs. The most popular modality was meditation, the sole component in 3 trials. Four trials reported interventions of mixed techniques, including meditation as the predominant component. Two studies reported breath regulation techniques, 1 study reported breath regulation and yogic postures, and another study reported yogic postures alone. Two studies featured tai chi practitioners, and 1 study investigated qigong. A small pilot trial reported the rapid response of 3 subjects to a session of clinical hypnosis. When categorizing these interventions between stationary/seated (eg, meditation and breath regulation) and dynamic practices (eg, yoga, tai chi, and walking meditation), 9 trials utilized exclusively stationary MBTs, while 6 utilized dynamic components. Regarding the origin of the traditions studied, 5 studies reported on yoga-derived interventions, 3 utilized Buddhist-derived practices, 3 utilized practices from traditional Chinese medicine, 1 reported on a European-derived technique (hypnosis), and 3 involved mixed techniques or practices of unknown origin. The majority of the studies used methods in transcriptomics. Thirteen studies assessed gene expression by partially or fully sequencing the transcriptome of peripheral white blood cells. Eight studies used microarray technologies alone, 2 studies used polymerase chain reaction (PCR) methods alone, 2 studies used microarrays in concordance with PCR methods, and 1 trial used microarray and ribonuclease protection assay. With regard to tissues sampled, 9 trials reported analyzing peripheral blood mononuclear cells (PBMCs) including lymphocytes and monocytes; 2 trials reported analyzing lymphocytes alone; 1 study reported analyzing neutrophils; and 1 study did not specify the type of leukocyte analyzed. Of the remaining 2 studies, the first analyzed proteomic changes in peripheral blood with difference gel electrophoresis and Western blot techniques, and the second reported assessing DNA methylation in saliva samples. The majority of published research applying functional genomics methods to MBT is in the field of transcriptomics, supporting the correlation of transcriptomic, and thus epigenetic, changes with MBT. Despite the heterogeneity of the reviewed studies, the study results link MBTs to changes in cellular processes of inflammation, apoptosis, ubiquitin-dependent protein catabolism, and telomere regulation. Downregulation of the NF-κB pathway as a result of MBT has been documented in multiweek interventions40,41,44,48,54 and in rapid-response gene transcription following MBT.47,48 In our group's initial study in this area, gene ontology analysis revealed an overrepresentation of genes related to the NF-κB cascade in genes downregulated in healthy adults following 8 weeks of meditation training.54 Antoni et al reported that specific NF-κB target cytokines were differentially downregulated following a 10-week comprehensive stress management program compared to controls.40 At 6- and 12-month follow-up, bioinformatics analysis revealed reduced activity of NF-κB, indicated by significant underrepresentation of genes targeted by NF-κB transcription factors in genes differentially upregulated in the intervention group. Black et al found similar reduced expression in genes with NF-κB response elements following an 8-week training in Kirtan Kriya meditation.44 In a 2012 study of a mindfulness-based stress reduction (MBSR) intervention for older adults, Creswell et al found increased expression of NF-κB–related genes at baseline in the individuals who reported greater loneliness.42 The MBSR intervention reversed this trend, effecting reduced activity in the NF-κB pathway in the MBSR group relative to waitlist controls. In a 12-week randomized controlled trial of an Iyengar yoga intervention for stage 0-II breast cancer survivors with treatment- or disease-related fatigue, Bower et al found reduced activity of NF-κB, along with increased activity of the antiinflammatory glucocorticoid receptor at both endpoint and 3-month follow-up.41 NF-κB–related expression changes have been implicated even in rapid responses to MBT. Our group identified downregulation of NF-κB and its interactants in both experienced MBT practitioners and newly trained individuals relative to baseline.48 In a targeted analysis of inflammatory, circadian, and histone modification mechanism gene expression, Kaliman et al found that meditators had significantly downregulated expression of receptor-interacting serine/threonine-protein kinase 2 (RIPK2) and COX2 during the course of an 8-hour meditation retreat.47 RIPK2 and COX2 are component genes in NF-κB–dependent pathways. Apoptosis is the process of programmed cell death seen in all multicellular organisms. Regulation of these apoptotic processes through regulators such as B-cell lymphoma 2 (Bcl-2) and heat-shock protein groups such as 70 kilodalton heat-shock proteins (Hsp70) may be another common target of MBT. This relationship appears complicated: upregulation of antiapoptotic genes in PBMCs has been demonstrated in trials of yogic breath regulation;37,38 an early trial of gene expression in neutrophils of qigong practitioners found significant downregulation of antiapoptotic Bcl-2 and B-cell lymphoma-extra large (Bcl-xL) but upregulation of antiapoptotic Hsp70.36 A pilot study of gene expression changes in advanced meditation practitioners during practice demonstrated rapid downregulation of antiapoptotic genes,46 although the small sample size (n=2) limits interpretation of these data. In our group's studies,48,54 we observed significant changes in expression of genes related to apoptotic regulation in cross-sectional analysis between experienced MBT practitioners and naive controls and prospectively during an 8-week intervention. Massage therapy has been demonstrated to reduce psychological stress77 and to influence immune function78,79—both effects commonly seen with MBTs—and may bear genomic similarities to MBTs. A pilot trial found that a 40-minute session of traditional Japanese massage therapy effected PBMC upregulation of genes related to immune response compared to a 40-minute resting control period in 2 healthy women.80 Bittman et al found that participation in a creative music-making group significantly reversed proinflammatory cytokine expression activity.81 These studies suggest shared gene expression changes that may be related to a common signature around perceived stress reduction. MBTs have been used to treat a wide variety of diseases, among them irritable bowel syndrome,15 hypertension,6,14 insomnia,6,16 and depression.19,20,21 By comparing the gene expression changes associated with disease states to the gene expression changes elicited by MBTs, it is possible to identify diseases in which MBTs counterregulate gene pathways central to the illness (ie, downregulate or upregulate genes typically upregulated or downregulated, respectively, by the disease process). Such elucidation of counterregulated gene expression signatures may improve knowledge of the mechanisms of MBTs and suggest the use of MBTs in novel treatment contexts. Two studies suggest that the genomic signature of chronic stress in humans is driven primarily by upregulation of the NF-κB pathway, coupled with blunted glucocorticoid signaling.52,83 This stress signature shares common domains with, but runs opposite to, the signature of MBT. This stress signature shows strong overlap with the gene expression profile of traumatic stress seen in PTSD that involves significant upregulation of the NF-κB pathway84 and apoptotic modulation,85 thus overlapping significantly with domains of the MBT signature. Given the link between MBT, inflammation, and immune response, cancer is another potential epigenetic target of MBT. Our group is investigating hypotheses stating that the MBT-associated gene signature runs counter to gene expression changes seen in the progression of hematological cancers, such as multiple myeloma.86 Studies have demonstrated MBT-related gene expression changes in patients with breast cancer40 and leukemia,38 although no connection to disease status or progression has been observed. While the impact of MBT on disease progression is modest in aggregate, functional genomics is useful in identifying individual propensities to improve through treatment, as well as propensities to develop diseases, and may prove beneficial in understanding treatment response to MBT. Few studies look directly at changes to the epigenome through MBTs. Histone protein modifications in brain tissue in response to stress take effect rapidly,87 so changes related to stress-reducing practices like MBT may be similarly fast acting. Selective downregulation of histone deacetylase genes HDAC2, HDAC3, and HDAC9 has been observed following a single 8-hour meditation retreat, indicating the likelihood of rapid epigenetic activity following MBT.47 In a cross-sectional study of female tai chi practitioners, Ren et al found evidence of long-term epigenetic changes resulting from practice.39 Of 60 a priori targeted age-related CpG sites, 6 sites (17p 7, Xp13 1, Rad50 2, Rad50 10, G6PD 6, and G6PD 7) showed significant differentiation in methylation between practitioners and controls, with some changes showing age-related variation. While the clinical impact of these changes is unknown, methylation analyses in MBT interventions can provide insight into whether methylation changes are observable during short-term therapeutic intervals or only after years of practice. Ultimately, correlation of DNA methylation changes with simultaneous gene expression profile analyses could identify causal relationships between DNA methylation and gene expression changes following MBT. Similar positive changes in telomere maintenance have been seen in studies of MBT. In their study of Kirtan Kriya meditation in dementia caregivers, Black et al44 found that meditators had significant increases in telomerase activity during the 8-week study period compared to controls (43% vs 4%). Increases in telomerase activity have also been observed following a 4-month qigong intervention93 and for experienced meditators following an intensive 3-month meditation retreat.94 A further group reported increased telomerase activity for both an MBSR group and waitlist controls.95 In addition, our group found that long-term practice of MBT was linked to upregulation of genes related to telomere maintenance.48 Effects of MBT on telomeres may be subject to specific characteristics of both the practice and the practitioner. Hoge et al96 have reported longer telomere length in female long-term practitioners of loving-kindness meditation compared to matched, meditation-naive controls, with no significant effect in male practitioners. While several general trends can be deduced from functional genomics outcomes with MBT, the results reported thus far must be interpreted with caution. For example, while downregulation of the NF-κB pathway is the dominant genomics trend in the mind-body literature, several studies did not report NF-κB–related downregulation.36,37,45 Such variation in results may be because of the diversity of study designs and research questions chosen by individual research groups in this developing field. In a 2013 case, Qu et al used a within-subjects model examining experienced yoga practitioners on a retreat.45 While this design reduced potential confounds, the short time window did not allow for analysis of long-term gene expression changes that may have resulted from subjects' years of practice, highlighting the difficulty in comparing these results with other trials. In general, greater coordination between groups in assembling similar study designs and questions will be critical for moving the field of mind-body genomics forward. Uniformity in sample populations, intervention lengths, and genomics methodologies will ensure easier comparisons among trials. Another key development that we recommend is supplementation of microarrays with more advanced techniques. As mentioned above, several genomics techniques, such as RNA-Seq and DNA methylation sequencing, have yet to be fully utilized in mind-body research. Greater use of these techniques will accelerate our understanding of MBT-related genomics changes. In addition to these broad recommendations, the field may now be developed enough to address several significant limitations in the current body of literature. For example, most of the studies included in this review are small trials, limiting the strength of conclusions. Our review of the literature found only 1 study with more than 100 subjects, the findings of which are difficult to compare to those of other studies as it is the only trial to target DNA methylation. Several of the studies covered in this review used active control conditions40,41,44 but not all adequately controlled for attention. In 1 study, the active group met weekly for 10 weeks; the control group received a 1-day intensive intervention.40 Within the field of mind-body medicine, there have been recent advancements in using health or stress education programs as active controls for meditation interventions.96 Providing controls with a daily activity, such as reading or listening to music or audiobooks, can control for MBT practice time and the presence of a daily routine. With the exception of a 2014 trial,41 none of the studies included in this review used this design for mind-body genomics analyses. We recommend that, when applicable, future studies feature adequately sized control groups receiving non-MBT interventions, such as stress education. As mentioned earlier, the diversity in specific cell types used in transcriptomic analysis deserves careful consideration. Individual white blood cell types vary in their expression of mRNA, and thus observed changes in expression for whole blood may be driven in part by alterations in leukocyte composition or by 1 cell population rather than indicating changes in expression across multiple cell types.33 We recommend that future trials include an examination of specific peripheral blood cell lines; in addition, the investigation of non-PBMC tissues (such as the prostate biopsies in men with prostate cancer noted above91,92) would greatly expand our understanding of the effect of MBT on different tissue types and in different disease states. Heterogeneity of subject populations creates further contextual challenges. Some trials reviewed above investigated patients with specific disease states, while others opted for healthy subjects. Comparisons between these populations should be made cautiously, as certain diseases may predispose subjects to show blunted or heightened genomic responses to MBTs, or disease-related genomic shifts may hide subtle MBT-related responses. While we advocate for trials researching the effect of these practices in clinical populations, well-powered studies with healthy subjects are also needed to determine a baseline genomic signature with greater confidence. Additional research to discern the length of practice that is needed for long-term benefit from MBT would be helpful. Cross-sectional studies of long-term practitioners have clear methodological limitations, and long-term longitudinal studies are practically difficult and often prohibitively expensive. A research design that has been suggested to address these issues is temporary practice pause then resumption (TPPR).97 TPPR pairs experienced practitioners against each other as controls, as some practitioners are randomized to halt their mind-body practice for an observed interval. The TPPR model might be a novel and cost-effective method to address several issues at once: the possibility of a confounding characteristic (personality or otherwise) that influences someone to choose to practice a mind-body technique long term, the potential for enduring epigenetic changes to be overlooked in rapid-response study designs, and the difficulty in determining how much practice experience is necessary to evoke the long-term response signature. Another point of consideration is the heterogeneity of MBT practices themselves. The literature contains trials of both sedentary practices (such as meditation or yogic breath regulation) and dynamic practices (such as yoga asanas and qigong) that may differ in objects of mental attention, levels of physiological arousal, and general goals of practice. Even within meditation, the most common practice encountered in this review, there may be considerable variation. A 2013 trial of MBSR that included training in multiple mind-body techniques, such as yoga, body scans, and sitting mediation, found differential levels of circulating inflammatory markers depending upon which technique was used most frequently for daily practice.62 Furthermore, while we have used the broad term MBT to describe these practices, many studies did not involve a specific therapeutic context. Further studies may need to account for social effects within these various techniques and determine specific benefits that may be associated with individual or group mind-body practice. In addition, comparisons between mind-body group interventions and group-based active controls may be able to differentiate effects that are specific to MBTs from those common to group therapies. The frequency and time of MBT practice in research interventions also deserve consideration. Current protocols for short-term interventions favor 8- to 12-week models with weekly visits and daily practice; these have demonstrated clear clinical benefits. However, the specific daily prescription varied among studies covered here; for example, 1 study involved practice only twice weekly.41 For the trials included in this review, practice fidelity of study participants was either not recorded or not reported, so conclusions cannot be drawn about the importance of intervention adherence for genomic determinants. MBT-related gene expression may be a biomarker suited to a dose-response relationship, and future studies should strive to accurately record subjects' frequency and duration of practice. Despite the heterogeneity of mind-body practices in the studies reviewed, we hypothesize that these practices share a common underlying physiology—just as different forms of exercise share a common set of underlying physiological changes whether one is running, kayaking, biking, or swimming. Needless to say, different MBTs cannot be identical in their effects on the brain and the body. Still, the ability of varied mind-body practices to demonstrate similar physiological effects98 and to effect correspondingly similar clinical changes6,22,99 is evidence that diverse MBTs may take effect through shared molecular mechanisms and may share a core genomic signature with reliably regulated components. The field of mind-body genomics is still in its infancy, but the body of literature is growing, particularly in transcriptomics. The heterogeneity of practices and research methodologies speaks to the general diversity within mind-body medicine, and many trials are limited by methodological challenges. Preliminary results indicate the presence of an underlying common genomic signature shared across diverse practices, focused on key hubs of expression such as downregulation of the NF-κB proinflammatory pathway. Large-scale randomized controlled trials will confirm or reject the other signature hubs outlined above, including regulation of apoptosis, telomerase function, and ubiquitin-dependent catabolism. In addition, the exciting expansion of MBT studies into epigenomics, using histone modification analysis and DNA methylation sequencing technologies, will greatly increase our understanding of epigenetic changes following MBT and allow a fuller picture of how MBT may have lasting effects. As increased resources are invested in functional genomics studies in diseases known or hypothesized to be stress-related and thus amenable to mind-body approaches, studies will be able to determine specific pathways of action and identify new potential targets for these interventions. This body of work will provide greater understanding of the profound links between the mind, the body, and the environment and inform clinical practice by providing doctors and their patients with an understanding of how to prevent disease, treat disease, and promote health using MBTs. (7 24, 2014) Outpatient glycemic control with a bionic pancreas in type 1 diabetes. N Engl J Med 371(4):313–325, pmid:24931572. (5, 2013) Treating B-cell cancer with T cells expressing anti-CD19 chimeric antigen receptors. Nat Rev Clin Oncol 10(5):267–276, pmid:23546520. (2008) Complementary and alternative medicine use among adults and children: United States, 2007. Natl Health Stat Report (12):1–23, pmid:19361005, Dec 10. (2009) Costs of complementary and alternative medicine (CAM) and frequency of visits to CAM practitioners: United States, 2007. Natl Health Stat Report (18):1–14, pmid:19771719, Jul 30. (4, 2014) Regional variation in use of complementary health approaches by U.S. adults. NCHS Data Brief (146):1–8, pmid:24750666. (Mar-Apr 2003) Mind-body medicine: state of the science, implications for practice. J Am Board Fam Pract 16(2):131–147, pmid:12665179. (2, 1974) The relaxation response. Psychiatry 37(1):37–46, pmid:4810622. (11 28, 2005) Meditation experience is associated with increased cortical thickness. Neuroreport 16(17):1893–1897, pmid:16272874. (1, 2013) The effect of meditation on brain structure: cortical thickness mapping and diffusion tensor imaging. Soc Cogn Affect Neurosci 8(1):27–33, pmid:22569185. (11 27, 2013) Meditation's impact on default mode network and hippocampus in mild cognitive impairment: a pilot study. Neurosci Lett 556:15–19, pmid:24120430. (12 13, 2011) Meditation experience is associated with differences in default mode network activity and connectivity. Proc Natl Acad Sci U S A 108(50):20254–20259, pmid:22114193. (9, 2014) Yoga and meditation in cardiovascular disease. Clin Res Cardiol 103(9):675–680, pmid:24464106, Erratum in: Clin Res Cardiol. 2014 Sep;103(9):763. (Jan-Feb 2010) Top-down and bottom-up mechanisms in mind-body medicine: development of an integrative framework for psychophysiological research. Explore (NY) 6(1):29–41, pmid:20129310. (3, 2008) Stress management versus lifestyle modification on systolic hypertension and medication elimination: a randomized trial. J Altern Complement Med 14(2):129–138, pmid:18315510. (11, 2008) Complementary and alternative medicine for IBS in adults: mind-body interventions. Nat Clin Pract Gastroenterol Hepatol 5(11):624–636, pmid:18825145. (4, 2011) A systematic review of insomnia and complementary medicine. Sleep Med Rev 15(2):99–106, pmid:20965131. (Jan-Feb 2004) Mind-body therapies for the management of pain. Clin J Pain 20(1):27–32, pmid:14668653. (1, 2011) Mindfulness-based interventions for chronic pain: a systematic review of the evidence. J Altern Complement Med 17(1):83–93, pmid:21265650. (Sep-Oct 2012) Mind-body medicine therapies for a range of depression severity: a systematic review. Psychosomatics 53(5):407–423, pmid:22902090. (3, 2013) Mindfulness meditation practices as adjunctive treatments for psychiatric disorders. Psychiatr Clin North Am 36(1):141–152, pmid:23538083. (3, 2014) Meditation programs for psychological stress and well-being: a systematic review and meta-analysis. JAMA Intern Med 174(3):357–368, pmid:24395196. (6, 2013) Mind-body practices for posttraumatic stress disorder. J Investig Med 61(5):827–834. (6, 2013) Beyond medications and diet: alternative approaches to lowering blood pressure: a scientific statement from the American Heart Association. Hypertension 61(6):1360–1383, pmid:23608661. (2, 2013) Regulation of gene expression by yoga, meditation and related practices: a review of recent studies. Asian J Psychiatr 6(1):74–77, pmid:23380323. (3 28, 2013) Influence of metabolism on epigenetics and disease. Cell 153(1):56–69, pmid:23540690. 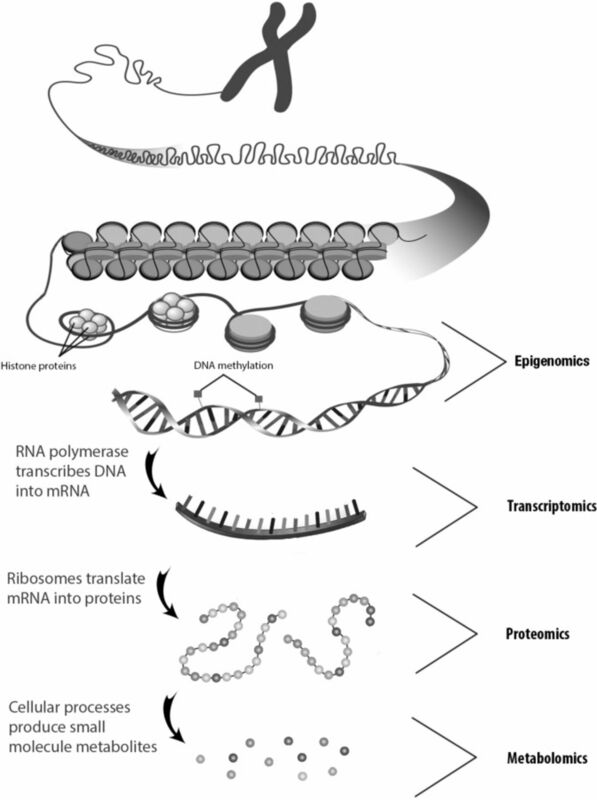 (12 14, 2012) Epigenetic regulation by long noncoding RNAs. Science 338(6113):1435–1439, pmid:23239728. (1 31, 2012) Understanding transgenerational epigenetic inheritance via the gametes in mammals. Nat Rev Genet 13(3):153–162, pmid:22290458. (5 6, 2012) Environmentally induced epigenetic transgenerational inheritance of phenotype and disease. Mol Cell Endocrinol 354(1-2):3–8, pmid:22020198. (8, 2014) Engineering chromatin states: chemical and synthetic biology approaches to investigate histone modification function. Biochim Biophys Acta 1839(8):644–656, pmid:24768924. (3, 2013) DNA methylation: roles in mammalian development. Nat Rev Genet 14(3):204–220, pmid:23400093. (2012) in Genomics and Systems Biology of Mammalian Cell Culture in Advances in Biochemical Engineering/Biotechnology, Transcriptome analysis, eds Hu WS, Zeng AP (Springer; New York, NY) In, eds, Vol, 127, pp 1–25. (10 4, 2013) Bench-to-bedside review: Future novel diagnostics for sepsis - a systems biology approach. Crit Care 17(5):231, pmid:24093155. (8, 2010) Elevating the perspective on human stress genomics. Psychoneuroendocrinology 35(7):955–962, pmid:20630660. (7, 2007) Cancer systems biology: exploring cancer-associated genes on cellular networks. Cell Mol Life Sci 64(14):1752–1762, pmid:17415519. (2008) A pilot study of positive expectations and focused attention via a new protocol for optimizing therapeutic hypnosis and psychotherapy assessed with DNA microarrays: the creative psychosocial genomic healing experience. Sleep Hypn 10(2):39–44. (2, 2005) Genomic profiling of neutrophil transcripts in Asian Qigong practitioners: a pilot study in gene regulation by mind-body interaction. J Altern Complement Med 11(1):29–39, pmid:15750361. (2, 2008) Gene expression profiling in practitioners of Sudarshan Kriya. J Psychosom Res 64(2):213–218, pmid:18222135. (11, 2009) To study the effect of the sequence of seven pranayama by Swami Ramdev on gene expression in leukaemia patients and rapid interpretation of gene expression. J Clin Pathol 62(11):1052–1053, pmid:19861570. (2012) Epigenetic changes in response to tai chi practice: a pilot investigation of DNA methylation marks. Evid Based Complement Alternat Med 2012:841810, pmid:22719790. (2 15, 2012) Cognitive-behavioral stress management reverses anxiety-related leukocyte transcriptional dynamics. Biol Psychiatry 71(4):366–372, pmid:22088795. (5, 2014) Yoga reduces inflammatory signaling in fatigued breast cancer survivors: a randomized controlled trial. Psychoneuroendocrinology 43:20–29, pmid:24703167. (10, 2012) Mindfulness-Based Stress Reduction training reduces loneliness and pro-inflammatory gene expression in older adults: a small randomized controlled trial. Brain Behav Immun 26(7):1095–1101, pmid:22820409. (1, 2010) Increased complement factor H with decreased factor B determined by proteomic differential displays as a biomarker of tai chi chuan exercise. Clin Chem 56(1):127–131, pmid:19884489. (3, 2013) Yogic meditation reverses NF-kappaB and IRF-related transcriptome dynamics in leukocytes of family dementia caregivers in a randomized controlled trial. Psychoneuroendocrinology 38(3):348–355, pmid:22795617. (2013) Rapid gene expression changes in peripheral blood lymphocytes upon practice of a comprehensive yoga program. PLoS One 8(4), Apr 17, e61910. (9, 2012) Genome-wide expression changes in a higher state of consciousness. Conscious Cogn 21(3):1322–1344, pmid:22742996. (2, 2014) Rapid changes in histone deacetylases and inflammatory gene expression in expert meditators. Psychoneuroendocrinology 40:96–107, pmid:24485481. (2013) Relaxation response induces temporal transcriptome changes in energy metabolism, insulin secretion and inflammatory pathways. PLoS One 8(5), May 1, e62817. (2011) Molecular pathways in cancer-related inflammation. Biochem Med (Zagreb) 21(3):264–275, pmid:22420240. (7 24, 2008) Cancer-related inflammation. Nature 454(7203):436–444, pmid:18650914. (1, 2001) Therapeutic potential of inhibition of the NF-kappaB pathway in the treatment of inflammation and cancer. J Clin Invest 107(2):135–142, pmid:11160126. (8 15, 2008) A functional genomic fingerprint of chronic stress in humans: blunted glucocorticoid and increased NF-kappaB signaling. Biol Psychiatry 64(4):266–272, pmid:18440494. (2, 2004) A physical and functional map of the human TNF-alpha/NF-kappa B signal transduction pathway. Nat Cell Biol 6(2):97–105, pmid:14743216. (2008) Genomic counter-stress changes induced by the relaxation response. PLoS One 3(7), Jul 2, e2576. (7 22, 2003) Chronic stress and age-related increases in the proinflammatory cytokine IL-6. Proc Natl Acad Sci U S A 100(15):9090–9095, pmid:12840146. (5, 2014) Effects of Buddhism walking meditation on depression, functional fitness, and endothelium-dependent vasodilation in depressed elderly. J Altern Complement Med 20(5):411–416, pmid:24372522. (7, 2012) Efficacy of a short-term yoga-based lifestyle intervention in reducing stress and inflammation: preliminary results. J Altern Complement Med 18(7):662–667, pmid:22830969. (5, 2013) Adiponectin, interleukin-6, and cardiovascular disease risk factors are modified by a short-term yoga-based lifestyle intervention in overweight and obese men. J Altern Complement Med 19(5):397–402, pmid:23210469. (6, 2008) Effects of yoga on inflammation and exercise capacity in patients with chronic heart failure. J Card Fail 14(5):407–413, pmid:18514933. (4, 2010) Benefits of yoga for African American heart failure patients. Med Sci Sports Exerc 42(4):651–657, pmid:19952833. (2, 2010) Stress, inflammation, and yoga practice. Psychosom Med 72(2):113–121, pmid:20064902. (10, 2013) Toward identifying the effects of the specific components of Mindfulness-Based Stress Reduction on biologic and emotional outcomes among older adults. J Altern Complement Med 19(10):787–792, pmid:23383976. (1, 2013) A comparison of Mindfulness-Based Stress Reduction and an active control in modulation of neurogenic inflammation. Brain Behav Immun 27(1):174–184, pmid:23092711. (1, 2013) Workplace based mindfulness practice and inflammation: a randomized trial. Brain Behav Immun 27(1):145–154, pmid:23078984. (1, 2009) Effect of compassion meditation on neuroendocrine, innate immune and behavioral responses to psychosocial stress. Psychoneuroendocrinology 34(1):87–98, pmid:18835662. (6, 2011) Effects of Tai Chi Chuan on insulin and cytokine levels in a randomized controlled pilot study on breast cancer survivors. Clin Breast Cancer 11(3):161–170, pmid:21665136. (2001) Changes in cytokine production in healthy subjects practicing Guolin Qigong: a pilot study. BMC Complement Altern Med 1:8, pmid:11696251. (11, 2007) One year pre-post intervention follow-up of psychological, immune, endocrine and blood pressure outcomes of Mindfulness-Based Stress Reduction (MBSR) in breast and prostate cancer outpatients. Brain Behav Immun 21(8):1038–1049, pmid:17521871. (12, 2011) Changes in transcriptional output of human peripheral blood mononuclear cells following resistance exercise. Eur J Appl Physiol 111(12):2919–2929, pmid:21437602. (7 27, 2011) Increased proinflammatory and oxidant gene expression in circulating mononuclear cells in older adults: amelioration by habitual exercise. Physiol Genomics 43(14):895–902, pmid:21610086. (10, 2010) Antioxidant responses to an acute ultra-endurance exercise: impact on DNA stability and indications for an increased need for nutritive antioxidants in the early recovery phase. Br J Nutr 104(8):1129–1138, pmid:20637132. (1 1, 2010) Effect of exercise on gene expression profile in unfractionated peripheral blood leukocytes. Biochem Biophys Res Commun 391(1):846–851, pmid:19945435. (1, 2007) Exercise affects the gene expression profiles of human white blood cells. J Appl Physiol (1985) 102(1):26–36, pmid:16990507. (3, 2012) Passing the anaerobic threshold is associated with substantial changes in the gene expression profile in white blood cells. Eur J Appl Physiol 112(3):963–972, pmid:21717121. (11, 2007) Serum from exercising humans suppresses t-cell cytokine production. Cytokine 40(2):75–81, pmid:17919919. (2, 2014) Exercise: putting action into our epigenome. Sports Med 44(2):189–209, pmid:24163284. (12, 2010) Back massage therapy promotes psychological relaxation and an increase in salivary chromogranin A release. J Anesth 24(6):955–958, pmid:20683736. (2010) Massage therapy for people with HIV/AIDS. Cochrane Database Syst Rev (1), Jan 20, CD007502. (10 18, 2010) A preliminary study of the effects of a single session of Swedish massage on hypothalamic-pituitary-adrenal and immune function in normal individuals. J Altern Complement Med 16(10):1079–1088, pmid:20809811. (6, 2011) Effects of traditional Japanese massage therapy on gene expression: preliminary study. J Altern Complement Med 17(6):553–555, pmid:21595543. (2, 2005) Recreational music-making modulates the human stress response: a preliminary individualized gene expression strategy. Med Sci Monit 11(2):BR31–BR40, pmid:15668624. (4 10, 2012) A review of Omics research in acupuncture: the relevance and future prospects for understanding the nature of meridians and acupoints. J Ethnopharmacol 140(3):594–603, pmid:22322253. (6 10-17, 2005) Expression analysis of psychological stress-associated genes in peripheral blood leukocytes. Neurosci Lett 381(1-2):57–62, pmid:15882790. (2011) Transcriptional control of monocyte gene expression in post-traumatic stress disorder. Dis Markers 30(2-3):123–132, pmid:21508516. (5, 2005) Peripheral blood mononuclear cell gene expression profiles identify emergent post-traumatic stress disorder among trauma survivors. Mol Psychiatry Mol Psychiatry 10, 10(5), (5):500–513, 425, 514, pmid:15685253, Erratum in, 2005 May. (Fall 2009) 6th Annual International Conference of the Society for Integrative Oncology J Soc Integr Oncol, Genomic changes induced by the relaxation response counter genomic dysregulation of several cancers [abstract M35], (New York, NY) November 12-13, 2009, 7, 4, pp 173–186. (1, 2012) Stress and anxiety: structural plasticity and epigenetic regulation as a consequence of stress. Neuropharmacology 62(1):3–12, pmid:21807003. (11, 2013) Telomeres and human health. J Intern Med 274(5):399–413, pmid:24127938. (12 7, 2004) Accelerated telomere shortening in response to life stress. Proc Natl Acad Sci U S A 101(49):17312–17315, pmid:15574496. (4, 2006) Cell aging in relation to stress arousal and cardiovascular disease risk factors. Psychoneuroendocrinology 31(3):277–287, pmid:16298085. (11, 2008) Increased telomerase activity and comprehensive lifestyle changes: a pilot study. Lancet Oncol 9(11):1048–1057, pmid:18799354, Erratum in: Lancet Oncol. 2008 Dec;9(12):1124. (10, 2013) Effect of comprehensive lifestyle changes on telomerase activity and telomere length in men with biopsy-proven low-risk prostate cancer: 5-year follow-up of a descriptive pilot study. Lancet Oncol 14(11):1112–1120, pmid:24051140. (10, 2012) A randomized controlled trial of qigong exercise on fatigue symptoms, functioning, and telomerase activity in persons with chronic fatigue or chronic fatigue syndrome. Ann Behav Med 44(2):160–170, pmid:22736201. (6, 2011) Intensive meditation training, immune cell telomerase activity, and psychological mediators. Psychoneuroendocrinology 36(5):664–681, pmid:21035949. (7, 2012) Changes in stress, eating, and metabolic factors are related to changes in telomerase activity in a randomized mindfulness intervention pilot study. Psychoneuroendocrinology 37(7):917–928, pmid:22169588. (8, 2013) Loving-Kindness Meditation practice associated with longer telomeres in women. Brain Behav Immun 32:159–163, pmid:23602876. (10, 2013) Temporary practice pause then resumption (TPPR) study design: an extension of the withdrawal study design to complementary and alternative medicine mind and body interventions (CAM-MABI). J Altern Complement Med 19(10):833–837, pmid:23682588. (1983) The relaxation response: its subjective and objective historical precedents and physiology. TINS 6:281–284. (4, 1996) The efficacy of relaxation response interventions with adult patients: a review of the literature. J Cardiovasc Nurs 10(3):4–26, pmid:8820317.